Nature and conservation are some of our favourite book themes. 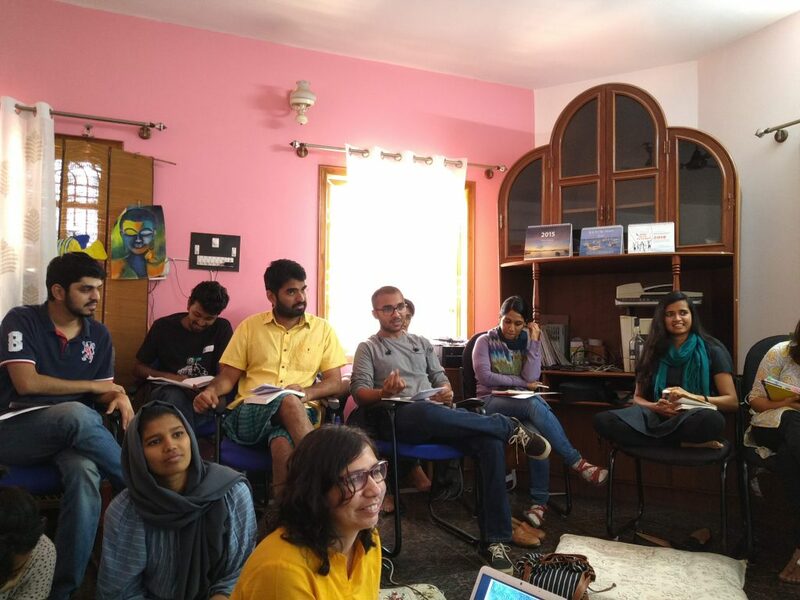 So, when we had the opportunity to host a workshop at the Dakshin Foundation, we were thrilled! Not only would we get to rub shoulders with experts in coastal, marine, and mountain conservation, but we also got to talk about our favourite topic – children’s books. We kickstarted the workshop with a fun, nostalgic ice breaker. We asked everyone to introduce themselves and tell us what their favourite storybook character was. From George (of Famous Five fame) to Eeyore (Winnie The Pooh), the list brought back tons of happy childhood memories and set the tone for the rest of the workshop. Once we were all acquainted, it was time to set the scene. We took the opportunity to talk to the Dakshin team about picture books for children, common themes that are very popular in storytelling, and what we look for at Pratham Books. Afterwards, we did a group exercise where each team was given the chance to discuss what they valued the most and the least in picture books. It was a great way to delve into what we each expect from books, and what we prioritise while writing and reading. Everyone was given the chance to share their thoughts and discuss with the wider group. We had an interesting debate on the importance of morality in books, whether learning has to be an emphasis while reading, and if difficult or dark topics had a place in children’s literature. Once we were done with the lively discussion, we moved on to a short introduction to STEM books by editor Yamini Vijayan. STEM books are so important because they introduce children to Science, Technology, Engineering and Math concepts while simultaneously appealing to their imaginations and using real world applications. From simple ecosystems to space travel – there’s so much to explore. At Pratham Books, we enjoy working with experts in STEM fields to create books that are both informative and interesting. The Dakshin team specialises in conservation in various spaces, and we knew they had tons of interesting stories just waiting to be told. Keeping that in mind, we began our first writing exercise.The idea was to try and tell a cohesive story with very eclectic image prompts. No easy feat. While the folks at Dakshin aren’t experienced writers, we had a hunch that they would have great imaginations. We weren’t disappointed! From fairytales to time travel – the tales they spun from a few disconnected images were a good indicator of what was to come. After a short lunch break, and a quick introduction to Storyweaver, our open source storytelling platform that hosts tales from all over the world, we were ready for the second writing exercise. We asked the Dakshin team to come up with a few concepts based on their own fields of study. They each had the chance to chat to our team and refine their ideas. Afterwards, they were encouraged to sit down and commit their thoughts to paper. After an hour of writing time, we reconvened to share stories. It’s clear that the Dakshin folks are an imaginative lot! A lot of fun stories emerged from this exercise. From a killer whale with an identity crisis to a tragic kangaroo story, we had a lot of laughs (and came up with some great ideas as well). Not a bad day’s work!